The idea of a system of national highways is almost as old as the Good Roads Movement of the 1890's. One of the early advocates was Charles Henry Davis, an enthusiastic good roads man whose central idea went from being ahead of its time to one whose time had passed. Charles Henry Davis was raised in Philadelphia as a Quaker. In later years, he was a civil engineer, a yachtsman, and a wealthy businessman based in South Yarmouth, Massachusetts, where he lived in "The House of the Seven Chimneys." Known to friends as Carl, Davis was president of the American Road Machine Company, which he inherited, for many years. His grandfather, Edward Morris Davis of Philadelphia, and father, Henry Corbit Davis, had been involved in road construction commercially. Carl Davis' many accomplishments included construction of the first high-speed street railway from Washington, D.C., to Mount Vernon, President George Washington's home in Virginia. It was the early 1900's and the American public was looking to the newly developed automobile for transportation. The business was in its infancy, and most makes of cars were too high priced for the general public. Carl was convinced a reasonably priced car that could be bought by everyone was about to appear on the market. Just who was to bring it out was a mystery. A young man named Henry Ford had similar ideas about such a car . . . . Carl approached Henry with the proposition that he lease his whole Kentenia area to him on a basis that Ford do all the mining himself and pay Davis an agreed price per car load of coal at the minehead plus a royalty on each Ford car that was produced . . . . After lengthy negotiations this contract was achieved. As the years passed, this became the main source of Charles Henry Davis's wealth. Given this background, it was not surprising that Davis took an active interest in the Good Roads Movement. In 1911, Davis established the National Highways Association, which was incorporated in the District of Columbia in early 1912. Slogan: GOOD ROADS EVERYWHERE. But first and foremost, the National Highways Association supported National Highways. One of its earliest initiatives was publication of a map a 50,000-mile National Highways network, which he described as "a broad and comprehensive system of National Highways, built, owned, and maintained by the National Government." To propose the building of fifty thousand miles of National Highways may seem to the unthinking a revolutionary idea, yet fifty thousand miles of Highway is but little more than two per cent of the total road mileage of this country. These highways have not been merely drawn upon a map with a pencil in the hands of a theorist who decided "it would be a good thing to have a road here!" They have been accurately and carefully located by trained and experienced road engineers, working with a large and complete office and drafting force for more than four months. [It] consists of six great Main Highways, thirteen Trunk Line Highways and forty Link Highways, connecting the Mains and Trunks and reaching out in all directions until the country as a whole is covered with almost a spider-web tracery of highways. In spite of their effective disposition and the results they will accomplish when built, this spider-web of suggested roads aggregates barely more than 2 per cent of the total highways of the nation. The network would directly serve 66 percent of the population of the country, while connecting the capitals and all important cities. The population in adjoining counties accounted for 26 percent of the population, thus allowing the National Highways to serve 92 percent of the total population. No accurate estimate of the cost of this system of National Highways can be given without actual surveys. It is probably that $10,000 a mile would be a very liberal average cost-a total of $500,000,000. The nation can not permit the states to dictate the terms and conditions upon which our United States HIGHWAYS shall be built . . . . Only the nation can build the roads heavy enough, wide enough, straight enough for our national industrial and military needs. To Davis, the emphasis on rural roads-getting the farmer out of the mud-that had been the dominant element of the good roads movement made no sense. That was not, he pointed out, how the Nation's railroad network had been built. "Branch railroad lines were built after the trunk lines were established--otherwise they could not have existed. It must be the same with roads." As for proposals to establish a Federal-aid program of assistance to the States, Davis was opposed because he felt such a program would result in "getting roads built throughout the nation piecemeal." The National Highways Association believes that, when established, these national highways will increase the wealth, the power, and the importance of this country as nothing else can do besides that which has brought civilization to the savage, wealth to the poor, and happiness to all--GOOD ROADS. Local roads to be built by counties and towns without State or Federal aid. To get the project started, Davis proposed creation of a National Highway Commission to study and report to Congress on the proper Federal role in establishing a system of National Highways. He unleashed a publicity barrage of publications and speeches supporting the Four-Fold System. In addition, he affiliated with the named trails associations that were just then, in 1912 and 1913, beginning to proliferate, each becoming a "branch" of the National Highways Association. Davis also testified before the congressional committees considering highway legislation. The National Highways Association established its headquarters in the McLachlen Building in Washington. It also had a branch office at 18 Old Slip in New York City. Davis served as President of the association. 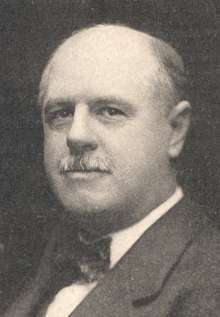 Coleman Du Pont, a member of the wealthy Du Pont family and a Delaware good roads advocate, was chairman of the Board of Councillors..
By the time The Automobile Journal interviewed Davis for a September 1913 article, the National Highways Association employed nearly 40 people in a unique office he had built on his property in South Yarmouth. The main office building is a long, low structure, 127 by 34 feet. Down the entire length of this room, on one side, are the drafting tables. On the other side are the desks occupied by the association's publicity department. Down the middle of the room is a long file of safes and filing cabinets. At right angles to this office runs another long building, almost as large, in which are the office of the president, the mailing room, the filing room, and the shipping departments. Connected with this, by a passageway, is the stenographers' room, and adjoining that is the printing department, where the latest and most improved mechanical equipment has been installed. Here are printed and distributed various circular letters and bulletins, the work of printing, folding, sealing and stamping being done by automatic machines. The eight draftsmen were key employees, working with State highway officials to develop up-to-date road maps of every State. "These maps," the article stated, "will prove of inestimable value to the proposed national highways commission, and in addition will be of service in showing the people of each state how the national government can make use of their roads in the proposed plan." To publicize National Highways and Good Roads everywhere he got all the states in the union to issue him license plate number 25. His ancient Hudson bore all these license tags. The other car, that always went along in case of a breakdown so Carl could be sure to be on time for his scheduled meetings, was plastered with the insignia of all the automobile societies in the country. Taken together these vehicles were an imposing sight and certainly got the general public to come to the alert and question just what this all stood for . . . . Davis always drove the lead car, followed by his two chauffeurs [sic] in the rear one . . . . He was a fantastic driver. Very fast, but equally careful and safe. At one time he held the record of having the fastest time of any single man driving from the Atlantic to the Pacific. As might be expected, Davis' favorite poem was Sam Walter Foss' "The House by the Side of the Road," which ends, "I want to live in a house by the side of the road and be a friend to man." Many people claim men cannot be gauged by facial expressions. If that is true Mr. Davis is an excellent example of the exception to the rule. You look at some men and think of despair, at others and think of sorrow. You observe Charles Henry Davis and think of energy, determination, honesty and kindliness. And his appearance, as you shall presently discover, does not belie him in the least. He is a man of more than average height, heavily built, but athletic. Brown eyes, grey hair that was once dark, a straight firm mouth, a broad, square jaw and a high and wide forehead. Add to them a glance than can frown meaningly, smile frequently and which speaks volumes for his tenacity; a voice that talks quietly and evenly, but tells you that its owner believes that he knows what he know; a hand-clasp that is strong and firm, and a dynamic something that seems to radiate from him and infect those about-and you will see Charles Henry Davis much as I have. He looks like, acts like and is-a powerful, forcible, working machine. He talks quickly and readily; he observes and comprehends easily and with directness, he writes with fluency and brevity. His conversation is dotted with a word that is expressive of the man. As he talks of past deeds or future plans, you hear him say, "what could be more obvious?" or, "that was the obvious thing to do," or, "it is obvious that there could be no other plan." That ability to select and to do the obvious thing is his great forte, his principal asset. When the subject turned to automobiles, Davis' face lights up. Although automobiles were in their infancy, he believes "they are one of the greatest forces for the health and wealth of future generations." By that point, according to the article, the National Highways Association had issued more than 500 maps, pamphlets, bulletins, and circulars totaling more than 15 million copies and had correspondence equal to several hundred thousand letters. Davis had traveled more than 350,000 miles by automobile. Cooperation was one of the concepts behind Davis' promotional activity. His inspiration was a speech by Speaker of the House Champ Clark regarding his methods of securing congressional action. "Get together" was the substance of the speech, as Davis recalled it. The National Highways Association, therefore, always sought to get together with other good roads organizations. He was disappointed, therefore, when AAA and other long-distance road advocates chose not to join him but instead rallied behind the Highway Industries Association, a trade group organized during the Great War (World War I) to support creation of a Federal Highway Commission to build a 50,000-mile national highway system. Headed by Henry G. Shirley, Chief Engineer of the Maryland State Roads Commission and the first president of the American Association of State Highway Officials (AASHO), the council represented mainly the interests of eastern and north central States that already had well-defined, limited State highway systems and strong highway departments. At the time, the Federal-aid highway program established in 1916 was practically on hold, with workers and materials taken over by the war effort. Therefore, the advocates of long-distance roads saw another opportunity to alter the Federal legislation that had been favored by advocates of Federal assistance to the States to help get farmers out of the mud. The debate would be resolved with enactment of the Federal Highway Act of 1921, which was signed on November 9 by President Warren Harding. The Act authorized Federal-aid funding for only 1 year ($75 million for FY 1922), plus $15 million over 2 years for forest roads and trails. However, the legislation established the features that would make the Federal-aid highway program a success, including the restriction of Federal-aid to a designation system of highways, a portion of which must be "interstate in character." The compromise bridged the gap between Federal-aid supporters and proponents of a national road system. As for Davis, he could only attribute the existence of separate groups such as the Highway Industries Association to "the personal equation," noting that, "We are a nation of individualists instead of cooperatists as we should be." Our old friend, Charles Henry Davis, has sent a stack of maps to the Governor and to the Secretary of State and to me, duplicates of the same stuff he has been sending out periodically for the last ten years . . . . I have regarded this as a harmless pastime on Mr. Davis' part . . . . I have been a member of the National Highway Association for a number of years but this organization in all its existance [sic] has never amounted to very much outside of getting out a lot of literature. The programs they have advanced have been of such a large scope that they could in no way be accepted . . . . The answer is that only time, persistence, plugging at it, preaching and talking will get across the only effective plan that has been advanced by any association nationally, the National Highways plan. We have had local road and State highway development helped by Federal Aid, but we have not yet succeeded in bringing about the building of National Highways. We cannot solve our highway problem and give adequate transit facilities except by a system of National Highways. And so our people are demanding that the Federal government shall solve the highway problem of the nation, as they previously demanded that the state should solve it for the state. These rural areas will gain about 90 per cent of the mileage, but there will result no hardship or unfairness to the populous states and urban centers, any more than state highways have been to the cities, that mostly paid for them, because, after all, they gain the most by the automatic gravitation of wealth to themselves. The United States, State, and local highways, he said, should be built around a fourth system of National Capital to Capital Highways totaling 50,000 miles of "industrial and military highways, to carry the fast, the heavy, and the through traffic. To illustrate the simplicity of the concept, he returned to an argument he had frequently used since the earliest days of his promotion of National Highways. He argued that if Congress could approve a bill totaling only 125 words authorizing construction of the Panama Canal, a bill authorizing construction of a national system of highways "need not take more than 126 words." The object shall be to designate, promote, finance, locate, establish, build, operate and maintain, without profit, a National Highway with Air-Ports from the Atlantic Ocean to the Pacific Ocean across the United States of America, with all the rights, powers, duties, privileges and discretions necessary or required for said purposes and with the further right and power to convey to the United States of America said National Highway with Air-Ports in whole or part from time to time without cost to the government of the United States and without profit to the National Highway Foundation or the members thereof but in the Spirit of Public Service as a Monument and Free Gift to the Nation from the Members of the National Highway Foundation to the People of these United States of America. The "Four-Way" concept referred to four separate roadways side by side. Each roadway would carry traffic in one direction. One roadway for trucks and one for fast vehicles would carry traffic eastbound; two roadways, similarly divided, would carry traffic westbound. Each roadway would initially carry three lanes of traffic, for a total of 12 lanes (six for trucks, six for fast vehicles). The number of lanes would expand as needed. An important design feature was that the roadways would not have any at-grade crossings. Entrances and exits would be by ramps or inclines to elevated sections of the motorway. The Four-Way Motor-Way was one of many superhighway proposals in the 1920's and 1930's that were designed to accommodate far more traffic than existed at the time. The Bureau of Public Roads would reject these ideas as development of the Interstate System began in the late 1930's. Davis had many other interests in his long life. He was, according to Frothingham, "a versatile yachtsman. His first love was sail, and racing was a passion." He founded the Davis Library of Highway Engineering in connection with the Graduate Course in Highway Engineering he funded in 1911 at Columbia University in New York City. In 1936, he donated an engineering library, valued at $250,000, to the University of Maryland, along with funds for a building to contain it. His interest in psychology prompted him to sponsor courses in Individual Psychology based on theories of the Austrian psychiatrist Alfred Adler. He was an advocate for world peace through establishment of a world government. He proposed in 1946 to raise $2 million to erect a huge statue of Prime Minister Winston Churchill, holding a cigar as the Statue of Liberty holds its torch. The statue was to be placed on Dover Cliffs in England. In a two-page chronology compiled by Davis in the late 1930's, he listed many accomplishments through 1937. It ends by noting that at the St. Regis Reservation, he had been given the Mohawk name La-wa-ya-no-wa-na, meaning "He does enormous things." Carl Davis had come a long way. As a child he spent summers with his family in "The Box," a camp meeting house south of Parkway Pier. In the end he lived in the majestic House of the Seven Chimneys on National Highways Circle. All his life he wanted "To live in a house by the side of the road, and be a friend of man." This he did as few men have ever done. Reference: \Frothingham, Ted, "Charles Henry Davis: Amazing Millionaire," Yarmouth Register, June 15 through September 17, 1972.